How long would your house last with a weak or unstable foundation? It’d be only a matter of time until the external structures crumbled. Building a strong foundation in our body works the same way. The foundation of how our body functions is generated from our center or core. Our arms and legs are simply levers tied to our core. Often in the gym you’ll see exercisers performing countless crunches and low back extensions. 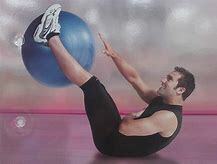 However, an additional function of our core that if often neglected is the function of preventing us from moving, in other words stabilizing our core against movement involved in daily activities. For example, when we’re carrying a heavy suitcase in one hand only, our core muscles are responsible for preventing us from tipping over. The following exercises are for intermediate and advanced exercisers and those without injury. As always, consult your physician before beginning any exercise. Breathe through each exercise. Modified Plank- Similar to a modified pushup position. An optional position is on your knees and elbows, instead of knees and hands. Keep your back straight and pull your belly button up. Pull your shoulders down away from your ears and tuck your chin in. Begin by holding for 10 seconds. For more of a challenge, progress to 30 seconds. Full Plank- Instead of positioning on your knees, position on your toes and elbows or hands. Full Plank and lift one foot- Begin in the same position as the Full Plank. Lift and hold one foot a few inches off the ground. Plank and lift one leg and one arm- Begin in the same position as the Full Plank. Lift one foot and hold a few inches off the ground. For more of a challenge, lift and hold the opposite-side elbow or hand off the ground. Side Plank- Position your body on your side. Lift your body so only your elbow/forearm or hand and side of your foot is on the ground. Side Plank and lift top leg- Begin in the same position as the Side Plank. Lift the top leg up and hold.